Featuring a robust steel construction and steel ball bearing runners for a prolonged operational life, the hard-wearing MICRO drawer is the preferred choice for leading retailers worldwide. 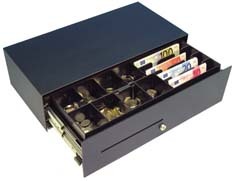 The unique design combines the footprint of a flip lid with all the functions of a front opening slide out cash drawer. It is ideal for any situation where space is limited due to its short opening of 173 mm. 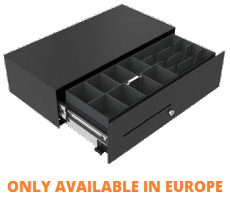 The MICRO insert is compatible with our 460mm wide flip lid drawer models (460MOD) providing a very practical solution for a retailer using both flip lid and slide out drawers within their stores. The removable high-volume insert can accommodate 4 notes and 8 coins, with additional media storage underneath the coin cups. The insert is easy to carry to the back office and store in a safe.